Like many in the Jeffrey Ferris lineage, it would appear, women with their clothes off came to occupy the thoughts of Sherwood Ferris. 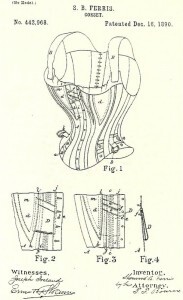 At the age of 33, in 1890, he was granted one of several patents for design improvements to the most important ladies undergarment of the day, the corset. He and brother Murry founded the Ferris Brothers Manufacturing Company in 1878 to make ladies underwear. Sherwood B. Ferris (1845-1923) and Murray Whiting Ferris (1850-1920) are the great-great-great-great-great-great-grandsons of Jeffrey Ferris. Born the the Ferris homeland of Connecticut, they moved to Lakewood, N.J. and built their business. 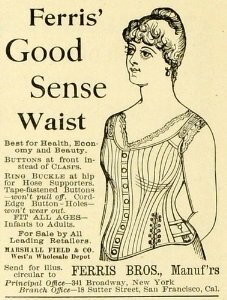 They were lauded for one product in particular, the Good Sense Waist corset. Ferris Brothers was noted for introducing a brand of children’s and women’s waists calle Ferris Good Sense Waists which became a brand name. These waists were considered healthier and more progressive than the traditional waists for girls and young women because they did not cinch in the waistline too tightly and, for the most part, they abandoned the custom of using whale bone or steel stays that actually did harm to developing bodies. The models for girls and women show some indentation but it was much less radical than what people had been used to. This advertising rhyme on a trade card celebrates the famous Ferris corset waist for women and children (both boys and girls). It was dated 1890. And “Good Sense” is its name!